← Off to warmer weather! Time for an update!! The last time I posted was before Florida and after I got home, things have been busy!! Florida was great – it was so nice to be in WARM weather in the SUN, unlike the nasty weather we’ve been having here. I got almost all of my workouts in – with the help of joining a local gym to use their pool and take spin classes, as I figured it would be safer and more efficient than renting a road bike (yes, I realize that sounds crazy to join a gym for a month to only use it four days, I’m ok with that). I also ate really good food, did a little shopping and topped it off with a little wine each night. Oh, and of course I went to the beach. Too bad I burn SUPER easily and had to wear long sleeves while ‘sunbathing’. Our flight home was a little less than ideal, especially for my sister, her husband and their little baby C who were also flying with me, because we had mechanical problems and had to de-board the plane. Most of the adults handled this situation well (I say most, you would be surprised what jerks some people can be, apparently several people on our flight failed kindergarten and didn’t learn how to wait their turn while in line), but little baby C wasn’t happy because she had been interrupted from her nap. Once we got back on the plane (several hours later), baby C was up and awake and not super happy, but my sister and her husband did an awesome job keeping her entertained and she hardly made any noise the rest of the flight. Phew. Wednesday morning I work up with a Migraine, which put me out of commission for most of the day, Thursday I had lots of catching up to do at work and came home exhausted, and by Friday I was still worn out and in no mood to hop on my trainer to get my ride in. For some reason that attitude carried over to Saturday as well. Now, sorry, probably TMI, but it was that time of the month, and I usually am pretty tired for a day or two… yeah, excuses, excuses, so that’s partly what the issue was but it was also like I had lost of mojo after an awesome week of training in Florida. I didn’t want to run in ugly grey, cold weather, I was over it! Finally, but Sunday I realized I couldn’t pay someone to carry me for the entire race coming up in less than 7 weeks, and I had to get back into training. So I hopped onto my trainer and rode for 1:30 followed by a 3 mile run in the snow, which was quite the messy run because we had just got dumped on with snow that day. 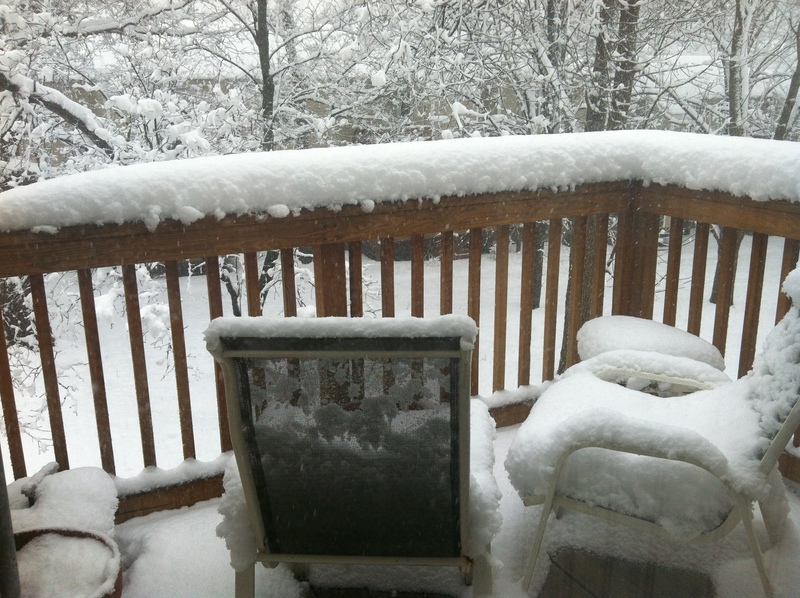 View from my deck. Good grief, it’s almost April! Not the longest or greatest training session, but at least it was a better start from the day before. Monday I had an easy 45min ride on the trainer and today I have a 6 mile run followed by an hour trainer ride. Fortunately my training buddy R is going to do the run with me, so that should help make it more entertaining. Non-training related, JMR did a great job house sitting and watching both dogs. Jackson did have several accidents in the kitchen, but that was to be expected, and Patrick did great also – a few mishaps after I got back from Florida, one including bringing in a dead mouse (ugh, I shrieked so loud when I saw him coming in with a tail hanging out of his mouth). 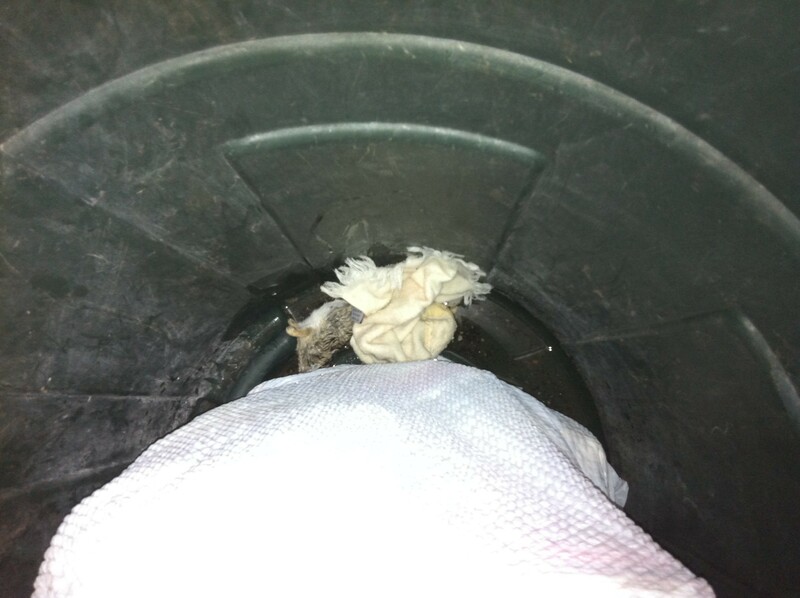 The dead mouse…in the trashcan, where it belongs. Not in Patrick’s mouth. Both dogs are alive and the house didn’t burn down, JMR said he would consider it a success if both of those things didn’t happen. Off to grab lunch before a meeting!